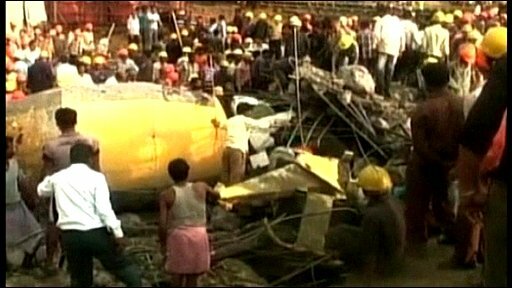 Rescue workers are continuing to search for bodies in debris at the site of a building collapse in the Indian state of Chhattisgarh. At least 26 bodies have now been recovered from the ruins of part of a power plant which collapsed yesterday, but officials warn the toll could rise. Officials say a chimney caved in on workers during construction at a thermal power plant in Korba district. Officials have provided varying death tolls since the accident happened. The BBC's Chris Morris in Delhi says that the trouble is that no-one seems to know how many labourers were in the vicinity when the huge chimney being built at the power plant collapsed. There was heavy rain and lightning when the accident took place, and some eye-witnesses said labourers who were not working were sheltering close to the construction site, our correspondent says. Cranes and heavy earth-moving equipment are being used to shift the remains of the collapsed chimney. Chhattisgarh Chief Minister Raman Singh said a judicial inquiry had been ordered into the accident. State officials said the management of the company building the plant were likely to face charges.